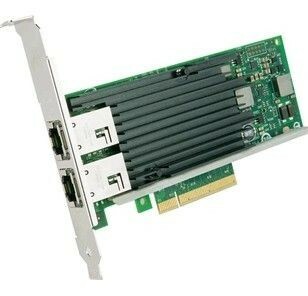 Produktinformationen "ALLNET ALL0135-2-10G-TX / PCIe X8 Dual 10G TX Card"
The new 10GBASE-T converged network adapter simplifies migration to 10 GbE, provides iSCSI, FCoE, Virtualization, and Flexible Port Partitioning. The ALLNET ALL0134-1-10G-TX/ALL0135-2-10G-TX network cards are the latest innovations in Intels leadership to drive 10 Gigabit Ethernet into the broader server market. This adapter hosts Intels latest Ethernet silicon, the ALLNET ALL0134-1-10G-TX/ALL0135-2-10G-TX network cards, which is used by many OEMs as a single chip solution for LAN on Mother board (LOM) to deliver 10 Gigabit Ethernet (10 GbE) on the latest server platforms. The ALLNET ALL0134-1-10G-TX/ALL0135-2-10G-TX network cards works with existing networks today. It works with legacy Gigabit Ethernet (GbE) switches and Cat 6A cabling. Install the ALLNET ALL0134-1-10G-TX/ALL0135-2-10G-TX adapter into a server and the auto-negotiation between 1 GbE and 10 GbE provides the necessary backwards compatibility that most customers require for a smooth transition and easy migration to 10 GbE. When time and budget allows, 10GBASE-T switches can be added any time to experience the full benefi ts of 10 GbE. 10GBASE-T uses the copper twisted pair cables that are very familiar to IT professionals today. It is everything you know and love about 1000BASE-T. The knowledge, training and investment in BASE-T are preserved. 10GBASE-T is the easiest and most versatile 10 GbE and you can deploy it anywhere in your data center. Its fl exible reach from 1 meter to 100 meters supports the latest network architectures including Top of Rack (ToR), Middle of Row (MoR), and End of Row (EoR). The new ALLNET ALL0134-1-10G-TX/ALL0135-2-10G-TX network cards are the lowest cost way to deploy 10 GbE in your data center today. The ALLNET ALL0134-1-10G-TX/ALL0135-2-10G-TX uses low cost, Cat6 and Cat 6A cabling. Chances are this cabling already exists in the data center. With the new ALL0134-1-10G-TX/ALL0135-2-10G-TX Controller, the MAC and the PHY are integrated into a single-chip solution. So, why is integration important? First, integration translates to lower power. A single-chip solution simply uses less power than two separate components. This means no more active heat sink and reduces the per-port power consumption. Second, integration also means lower cost per port. Manufacturing a single part costs less than two. When cabling is accounted for, cost efficiencies realized from a single part mean 10GBASE-T is the lowest cost media to deploy. With lower cost and power, 10GBASE-T is ready for broad deployment. 10GBASE-T is an option for every rack and tower server in the data center. The wait for a low cost 10 GbE copper solution to broadly deploy 10 GbE to all corners of the data center is over. The new ALL0134-1-10G-TX/ALL0135-2-10G-TX adapter provides bandwidth-intensive applications with highly affordable 10 GbE network performance and cost-effective RJ-45 connectivity for distances up to 100 meters. More than simply a 10x increase in performance, with 10 GbE there are exciting new usage models that are now possible, including Unified Networking (iSCSI, FCoE and LAN), Virtualization (VMDq and SR-IOV), and now, Flexible Port Partitioning (FPP). Virtualization changes the way server resources are deployed and managed by running multiple applications and operating systems independently on a single server. The ALLNET ALL0134-1-10G-TX/ALL0135-2-10G-TX network cards includes Intel Virtualization Technology for connectivity (Intel VT-c) to deliver I/O virtualization and Quality of Service (QoS) features designed directly into the ALL0134-1-10G-TX/ALL0135-2-10G-TX controller on the adapter. ALLNET I/O virtualization advances network connectivity models used in todays servers to more effi cient models by providing FPP, multiple Rx/Tx queues, and on-controller QoS functionality that can be used in both virtual and non-virtual server deployments. By taking advantage of the PCI-SIG SR-IOV specifi cation, ALLNET products enable FPP. With FPP, virtual controllers can be used by the Linux* host directly and/or assigned to virtual machines. FPP allows you to use the functionality of SR-IOV to assign up to 63 processes per port to virtual functions in Linux. This enables an administrator to partition their 10 GbE bandwidth across multiple processes, ensuring a QoS by giving each assigned process equal bandwidth. Network administrators may also rate-limit each of these services to control how much of the 10 GbE pipe is available to each process. iSCSI uses Ethernet to carry storage traffic, extending the familiarity and simplicity of Ethernet to storage networking, with out the need for SAN-specific adapters or switches. ALLNET ALL0134-1-10G-TX/ALL0135-2-10G-TX is the easiest, most reliable, and most cost-effective way of connecting servers to iSCSI SANs. Unified Networking solutions on the new ALLNET ALL0134-1-10GTX/ALL0135-2-10G-TX let you combine the traffic of multiple data center networks like LAN and SAN onto a single efficient network fabric. You now have the choice of NFS, iSCSI, or Fibre Channel over Ethernet (FCoE) to carry both network and storage traffic at speeds of up to 10 Gbps. The ALL0134-1-10G-TX/ALL0135-2-10G-TX adapter combines support for all of these traffic types in one adapter at no additional cost and with no additional licensing fees for the adapter. ALLNETs Network Cards are enabled through a combination of standard Intel® Ethernet products along with trusted network protocols integrated in the operating systems. Thus, Unified Networking is available on every Server either through LAN-on-Motherboard (LOM) implementation or via an add-in Network Interface Card (NIC). Open Architecture integrates networking with the server, enabling IT managers to reduce complexity and overhead while enabling a flexible and scalable data center network. Intelligent offloads lower cost and power while delivering the application performance that customers expect. Proven Ethernet unified Networking is built on trusted Intel Ethernet technology, enabling customers to deploy FCoE or iSCSI while maintaining the quality of their traditional Ethernet networks. Intels chipset supports Open FCoE solution enables in ALLNET ALL0134-1-10G-TX/ALL0135-2-10G-TX 10 Gigabit Server products (adapters and controllers) to support Fibre Channel payload encapsulated in Ethernet frames. There is no upgrade charge for Open FCoE on the adapter. Just as with iSCSI, now customers can easily connect to an FCoE network with ALLNET 10 GbE solutions. For the first time, Open-FCoE is now supported on 10GBASE-T. As 10GBASE-T switches come to market enabled with FCoE support, the ALL0134-1-10G-TX/ALL0135-2-10G-TX is ready when youre ready. This enables you to use cost-effective 10GBASE-T for all your converged networking needs. The Open-FCoE architecture uses a combination of FCoE initiators in Microsoft Windows* and Linux* operating systems and in the VMware* ESXi hypervisor to deliver high-performance FCoE solutions using standard 10 GbE Ethernet adapters. This approach enables IT managers to simplify the data center and standardize on a single adapter for LAN and SAN connectivity. The ALLNET ALL0134-1-10G-TX/ALL0135-2-10G-TX are designed to fully offload the FCoE data path to deliver full-featured converged network adapter (CNA) functionality without compromising on power efficiency and interoperability. Conventional Ethernet does not guarantee successful data delivery, which is not acceptable for SAN traffic. Ethernet enhancements such as Data Center Bridging (DCB) overcome that limitation with technologies that guarantee lossless delivery, congestion notification, priority-based flow control, and priority groups. The combination of 10 GbE and unifi ed networking helps organizations overcome connectivity challenges and simplify the data center infrastructure. 10 GbE provides a simple, well-understood fabric for virtualized data centers, one that helps reduce cost and complexity as the number of virtual machines continues to grow. Weiterführende Links zu "ALLNET ALL0135-2-10G-TX / PCIe X8 Dual 10G TX Card"
ALLNET Ersatznetzteil - 5V / 2A USB Typ A Buchse, Khadas, Friendly, banana pi etc.